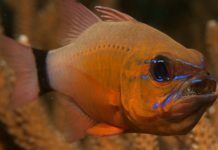 While most marine species are not mouthbrooders, the Jawfish from the genus Opistognathus, are paternal mouthbrooders recommended for the marine aquarist. 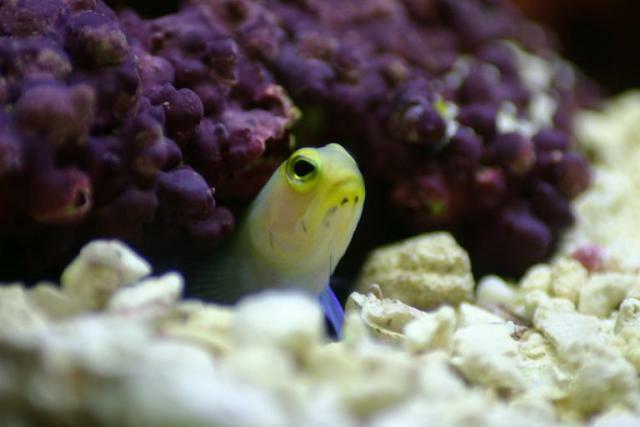 Jawfish are, generally speaking, small, peaceful marine fish. 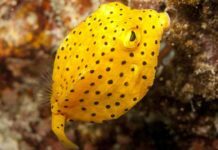 While some people may question this species’ price versus their somewhat secretive demeanor, behaviorally-speaking, this fascinating fish is worth every penny. 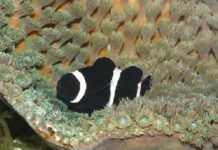 The jawfish-experienced aquarist could go on for hours about this fish’s borrowing and tunneling behavior, but the focus of this article, as a companion piece to the recent article on Cardinalfish, is on the jawfish as a mouthbrooder. 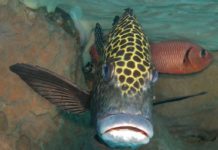 Mouthbrooding in marine species is not nearly as common as it is in freshwater species for a variety of reasons, but two commonly available saltwater fish in the hobby—Cardinalfish and Jawfish—are mouthbrooders. Like the Cardinalfish, it is the male that is responsible for incubating the eggs in his mouth. 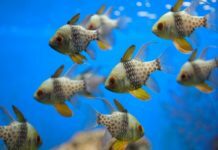 While Jawfish are not as easy to breed in captivity as Cardinalfish, the aquarist interested in experimenting with a fish that exhibits some of the most intriguing reproductive behavior should certainly consider a Jawfish. 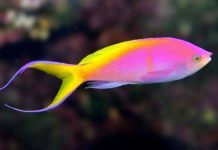 Assuming you have a Jawfish-ready tank (in terms of size, appropriate substrate, filtration and tankmates), it’s time to acquire a male-female pair of jawfish. 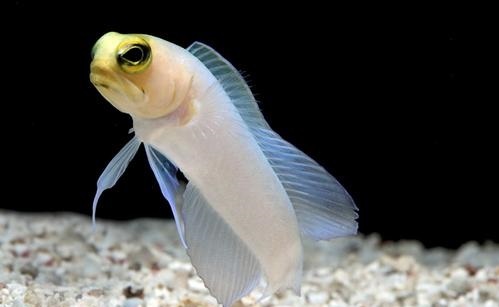 Of the recommended species to consider, the Pearly Jawfish (Opistognathus aurifrons) is a good starting point. 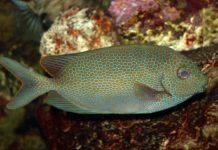 This is not only one of the most popular (read readily available) Jawfish species, but it is also simply one of the most popular marine species—and for good reason. 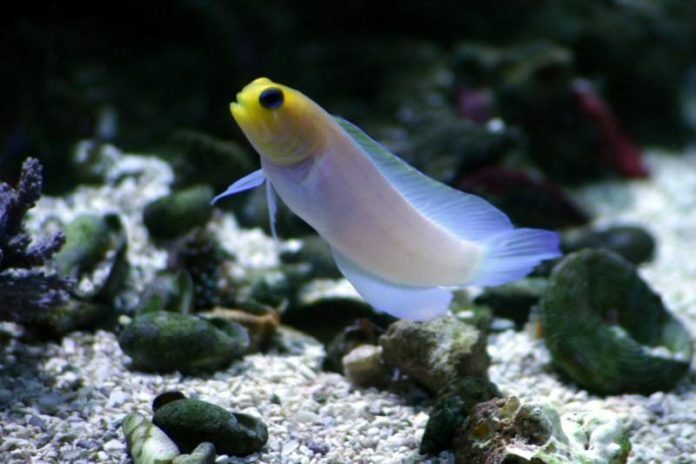 Opistognathus aurifrons, sometimes also sold as the Yellow Head Jawfish (or Yellow-Headed Jawfish), hails from the western Atlantic, and is known to be much more visible (e.g. more time out of the burrow) than many other species in the genus. Its coloration is dramatic—a yellow-pearly head color merging into a sky blue to aquamarine body. It grows to four inches in captivity and is relatively hardy. The downside to the Pearly Jawfish is that it does not exhibit the same sexual dichromatism as other Jawfish species. This can make acquiring a male-female pair somewhat difficult. Luckily for the aquarist intent on breeding this species, the Pearly Jawfish is one Jawfish species that can be kept in a small grouping (provided the tank is large enough). In other words, getting a small group increases your chances of obtaining a male-female pair. Once a pair is established, the male Pearly Jawfish courts the female by swimming in an arched position with his fins spread in her direction. Once you witness this behavior, look for the male to have a mouthful of eggs. If you observe the male carrying the eggs in his mouth, you have two choices. Either let nature take its course in the display tank OR remove the male to a separate breeder tank. The latter is often problematic (if not impossible) given that the Jawfish needs to have his burrows established, and the male cannot dig a new burrow while carrying the eggs. For this reason, removing the male Jawfish from the display tank while he is carrying the eggs is not recommended. The best plan is to remove the breeding pair of pearly Jawfish to their own tank before courtship. 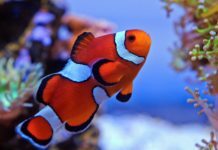 A refugium can be a good place for them or, even better, a dedicated jawfish breeding tank. Once released, the planktonic fry can survive on a diet of enriched rotifers (it is best to rear them in a breeder separate from their parents). This article is only intended as a very general overview. 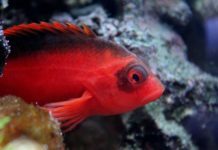 If you decide to attempt keeping Jawfish (to breed or not), make sure to do research on the specific species’ needs and behavior.